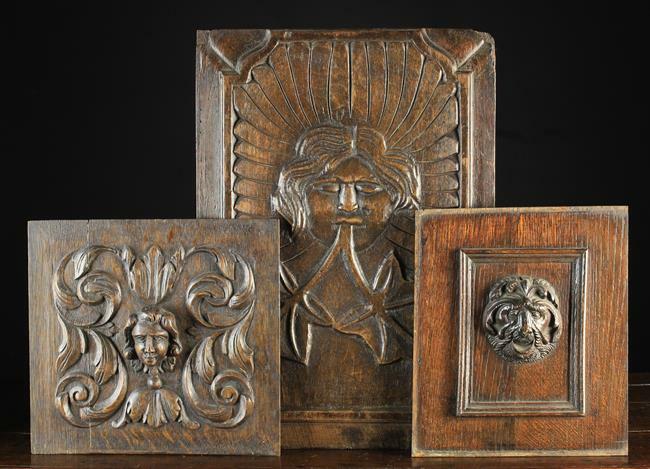 Three Antique Carved Oak Panels: A fielded panel with ogee moulded upper corners and a facemask amidst fluted rays, issuing from it's mouth a branched stem of large ivy leaves 20 ins x 14 ins (51 cm x 36 cm). The second panel centred by a protuberant head surrounded by scrolls of acanthus 11 ins x 12 ins (28 cm x 30.5 cm). The third with a relief carved lion mask framed by applied moulding, 11¾ ins x 10 ins (30 cm x 25.5 cm). Be the first to bid on this item!